Chelsea travel to the land of opulence this week to face Europa League champions Atletico Madrid in the UEFA Super Cup. Roberto di Matteo has said he is keen to add another European prize to the Stamford Bridge trophy cabinet and the game is sure to be competitive. Why Monaco all places? I have a theory. There’s no doubt that Monaco is not ranked among European football’s capitals – such as Barcelona, Milan, Munich, Amsterdam, Paris and London. 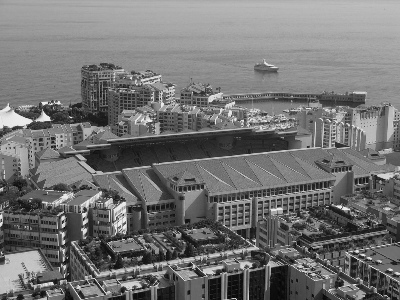 The stadium, the Stade Louis II, has a capacity of just 18,523. This suggests that the occasion is not about the fans but about corporate UEFA because it is sure to be luxurious. I suggest that UEFA would find it hard to host this match at one of the European heavyweights, given that clubs like Barca, Real, Milan and Bayern all failed to secure a trophy in 2011-12. It would be a kind of schadenfreude to parade the UEFA Super Cup in front of their fans and I think UEFA would not want to upset the blue riband clubs that really run European football. Perhaps I am being cynical. However, there are signs of a shift taking place. In 2013, the Super Cup will be played in Prague, in 2014 Cardiff City’s ground and 2015 Tbilisi. Again, no danger of any clubs from those cities being involved! Atletico will be stern opponents for Chelsea. They’ve won the Europa League twice in the past three years and last season finished fifth in La Liga. They beat Athletic Bilbao 3-0 in the Europa Final in Bucharest. British football fans will recall the “hire and fire” era of Jesus Gil (between 1987 and 2003) when such revered managers like Cesar Luis Menotti, Javier Clemente, Alfio Basile and Ron Atkinson (not sure what he’s doing in such exalted company) came and went. This all sounds very familiar! One of Atletico Madrid’s problems is they are not Real. Atletico themselves are a big club – they reached the European Cup final back in 1974 – but they are dwarfed by those characters at the Estadio Santiago Bernabeu. At the moment, they just cannot beat their neghbours – Atletico’s last victory in El Derbi madrileno was in 1999. In winning the Europa League, Atletico beat Stroemgodset (4-1 on agg) and Vitoria Guimaraes (6-0) in the qualifying stages before topping a group that comprised Celtic, Rennes and Udinese. In the knockout phase, they beat Lazio (4-1); Besiktas (6-1); Hannover (4-2); Valencia (5-2) and then Bilbao in the final. A Total of 19 games with just one defeat. That deserves respect. So who do we have to look out for? Colombian striker Falcao netted 27 goals last season, including two in the final. He’s already hit a hat-trick this season when Atletico beat old rivals Bilbao 4-0 on August 27. He has pace, two good feet and his exceptional in the air. The Chelsea defence will have their work cut out. Chelsea last won the Super Cup in 1998 when Gus Poyet’s goal was enough to beat Real Madrid. Atletico won it in 2010, beating Internazionale 2-0. Form suggests that the game could be a cracker. Chelsea are on top of the Premier and are settling nicely. Atletico have won one (that game with Bilbao) and drawn one of their two La Liga games so far. A good test, then, for both teams.